Dramatic mountains, deep valleys, vast limestone plateaux and plunging gorges - it's little wonder that the awe-inspiring scenery of the Causses and the Cevennes is a UNESCO-recognised Cultural Landscape. On this seven-night holiday you'll discover the natural beauty and fascinating geology of this incredible region - traverse the imposing plateaux of the Causses, picnic above plunging gorges as vultures swoop and circle overhead, cool your feet in fresh mountain streams and visit the amazing rock formations of Montpellier-le-Vieux. A short drive leads to other regional highlights including the Tarn Gorge, Aven Armand, the caves of Dargilan, the Cirque de Navacelles and the unique village of Roquefort. We provide fully detailed route notes for a wide variety of walks this week, ranging from level 1 to level 2, with many ranking amongst the most popular in France. Each showcases a different aspect of this dramatic region - choose a rewarding ascent through pine forest and beech woods to the lofty summit of Mont Aigoual (1565m) or a tranquil stroll alongside the crystal-clear waters of the River Tarn; you can even potter around the region's charming towns and villages such as Roquefort whose underground labyrinth of cellars harbours 5,000 tons of the famous cheese! Some of the best walks start directly from the hotel and with a hire car included you have even more flexibility, with the Cevennes National Park an easy drive away. 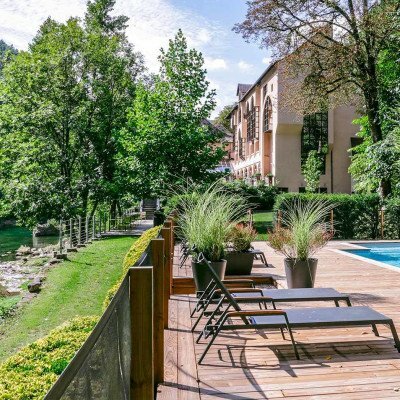 Your base for the week is the very stylish 4 Star Grand Hotel de la Muse et du Rozier, situated in a wonderfully tranquil spot against a backdrop of wooded hills with gardens leading down to the river. Watch herons and kingfishers as you relax on the terrace, take advantage of the private riverside 'beach', enjoy a dip in the heated swimming pool* or fish for trout on the River Tarn. Evening meals unite sumptuous regional produce and the best seasonal ingredients to produce traditional menus with an innovative twist. The hotel restaurant is closed on Monday and we have left this evening free to choose a local restaurant. * Open 15 June - 15 Sept. The paths are well made and maintained, but usually stony and/or rocky, so walking boots are essential. The majority of walks involve sharp climbs from the valley to the causse, and given the nature of the landscape you need to be a reasonably fit and confident walker with a fair head for heights. Walking poles are recommended. Arrive at our 4-star hotel in Le Rozier in time for dinner. A perfect way to start your week with a leisurely and totally flexible walk alongside the River Tarn. There are little river beaches and ideal picnic spots looking down on the crystal-clear waters. Griffon vultures, reintroduced in 1978, glide effortlessly on the thermals. This walk takes you through open pine woods interspersed with box and juniper and up to the amazing ruins of the C11 St Michael's Hermitage and the extraordinary prehistoric Mushroom Rock. There are fantastic views of the Jonte Gorge, and from the Point Sublime (a great picnic spot) you'll enjoy a spectacular panorama. You'll also catch your first glimpses of the unique rock formations known as the 'Vases' across the valley on the Causse Mejean. Today's highlights include stunning views of the Tarn Gorge and also long-distance views south west as far as Millau. Your first stop is the fascinating semi-troglodyte village of Eglazines, from where you climb on to the open causse - it's a big sky up there! Marvel at amazing formations such as the 'rock garden' on the descent to the quaint village of Liaucous. What a spectacular day, as you set off on one of the most dramatic walks in France, with stunning views across the Tarn and Jonte Gorges. You'll see griffon vultures soaring overhead - at over 8ft, their wingspan is colossal - and you'll discover amazing natural wonders such as the Anvil, the China Vase and the Vase of Sevres. Drive south, perhaps stopping first to explore the small towns of Le Rozier or Peyreleau before taking a path to the impressive Rochers des Roques-Altes. Stop for a picnic and enjoy panoramic views over the idyllic waters of the winding Dourbie Gorge, before heading back to the car and on to the atmospheric chaos of Montpellier-le-Vieux, a sprawling mass of dolomite limestone which locals once believed to be an ancient, forgotten city, hidden in the woods! Drive up onto the Causse Mejean to the hamlet of La Bourgarie. A gentle stroll across the plateau past traditional caussenade farm buildings and through the woods takes you to the amazing Cinglegros Rock. Then it's on to the Baus del Biel, a 40m-high natural limestone arch - a superb work of nature. If you've made an early start, why not drive across the causse to visit Aven Armand, a remarkable cavern containing a 'petrified forest' of 400 stalagmites and stalactites. Our walking base is the stylish Grand Hotel de la Muse et du Rozier, located on the banks of the river Tarn, near the confluence of the rivers Tarn and Jonte. It's a tranquil spot, with wooded hills behind and gardens leading down to the river. The hotel itself is modern, light and airy, with big picture windows and conservatories, and with each room carefully decorated to maximise peace, calm and tranquillity. The hotel benefits from lots of sitting areas - ideal for that after dinner drink or relaxing with a book after a day's walking. The bedrooms at the Muse et Rozier are tastefully designed and spacious, with each boasting fantastic views over the river Tarn, as well as a small sitting area where you can drink in those views. In addition, the hotel boasts a heated outdoor swimming pool and private riverside beach, and trout fishing is possible in the Tarn. Room upgrades: Privilege Room or Junior Suite. Privilege rooms are more spacious. Junior Suites are more spacious and have a sitting area. 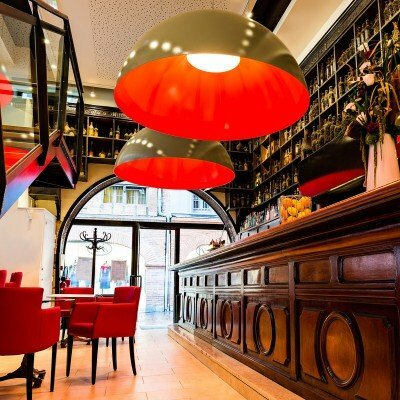 The Hotel Pere Leon is ideally situated just a short walk from the historic centre of Toulouse, with the main sights just a short walk away. Just 50 metres from the metro, there is easy access to the rest of the city. The hotel is in Place Esquirol, a bustling, lively square and in close proximity to many bars and restaurants. 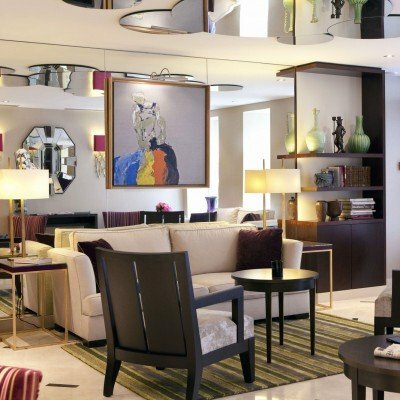 The hotel itself has a modern contemporary feel, which has been recently renovated. The ensuite rooms have soundproof windows and all mod cons. Breakfast is a buffet affair with a good choice of French staples, and a hot section. The hotel has its own bistro restaurant with seats outside where you can enjoy a drink or dinner. The deluxe room is larger than the standard room. The above tour-only prices exclude flights but include a Europcar Group B air-conditioned hire car which you collect from/return to Toulouse Blagnac airport. Area and scenery stunning. Walking some of the best and hardest we’ve done recently. Description of walks word perfect and gave us confidence to try harder walks as we could trust the notes were accurate. Hotel and setting stunning. Staff helpful and spoke good English. Food good - i’m Vegetarian and they cooked something every night. This can sometimes be difficult in France but not here. We were nearly put off by some of the lukewarm reviews about the hotel and food. Don’t be - we would recommend. As one of the other reviews said - we had looked at this holiday for a long time and been out off by mixed reviews. In fact this was our best headwater holiday so far. Thank you. Firstly, I cannot comment on value for money re the hotel - I do not have a cost split for the accommodation. The drinks seemed quite expensive. The room did not have air conditioning. Temperatures in June / July (34C one day and in the very high 20'sC the rest) would make this very welcome. Several nights were extremely hot. We were very unhappy with the taxi booked for us by the hotel which charged us 20 Euros for approximately 10kms. (From the hotel to Les Vignes). Whilst not the hotel's fault, they had made the booking and also claimed no knowledge of how much such a journey should cost when asked before the booking was made. I found this hard to believe. It just leaves a poor taste. No account had been made for the requirement not to be offered food with nuts in. The bread had nuts in every night. Alternative desserts were offered if asked for. We only found this out part way through the week. The menu was very limited. Clearly we were on a package deal for the food. The area is absolutely lovely and the hotel is decent. Not quite 4 star though. We had a good week. We would like to thank you for taking the time to provide your post-holiday feedback. Although, we were sorry to read of your disappointment with the standard of food at the hotel. Headwater customers are served a set menu, however should they prefer an alternative, the hotelier can provide this. We were also sorry to read that your requirement for no nuts wasn't understood by the restaurant team, we will of course work with them, to ensure that when our customers have dietary requirements, they are met. Many thanks for sharing your holiday experience, we look forward to welcoming you on another of our holidays in the future. Great location on the river for hill walking and kayaking. Hotel fab and food top class. Excellent location with interesting and challenging walking. Modern hotel with typical French cuisine with little choice for uncompromising Vegetarians. Usual buffet breakfast but with coffee served by way of 'pods'. Two pods per client! The first hotel that we have ever stayed in where on requesting a third cup of coffee I was told that I would be charged a surcharge. Rather odd given the number of croissants and amount of jam that I could have packed away. A new experience but not one to be repeated. All in all an excellent walking destination. Overall holiday was superb, great walking and super location. Beautiful hotel in idyllic location, accommodation, food and wine all excellent. Staff welcoming, friendly and always helpful with any queries. The Tarn Gorges was an extremely interesting area geographically and biologically. I have never seen such a wide variety of orchids and some quite rare varieties growing in abundance. The walks however are not easy especially if you don't like looking down shear drops and we did wonder whether some of the paths will actually be there in few years time as the rain was washing them away. Another excellent Headwater holiday with a good variation of walks and the opportunity to view birdlife not seen in an English garden. Wonderful dramatic scenery and fabulous walks. Take care with your choice of walks if you don't have a good head for heights. Some paths are narrow and very near the edges of huge vertical drops. We had another great holiday with Headwater. The walks and the scenery in the Tarn Gorge are stunning. I would class some of the walks as strenuous and adventurous , sometimes verging on being '3 boot'. The Hotel de la Muse enjoys a marvellous location overlooking the Tarn river and on occasion you can watch the vultures and herons fly whilst having dinner on the terrace. The hotel is excellent with spacious, clean, light rooms and large airy communal lounges/ spaces, great food and friendly staff. Local village of Rozier is quaint. On Monday night the hotel arranges for guests to eat in a local restaurant in Rozier where we enjoyed gourmet food and very friendly staff. THe sandwich shop on the corner of the village also good. We came by train from the UK to Avignon which is a very interesting city, well worth a visit. It is about a 4 to 5 hour drive from there to Rozier. All in all another memorable holiday. Very enjoyable. Lovely area and accommodation. Interesting and varied walking. You do need to be quite fit! Hotel in a beautiful location, welcoming and friendly staff, superb food and an excellent area for walking.A week was much too short! Challenging walks lead to magnificent and interesting views within this small area of France . We were rewarded with the most beautiful array of spring flowers including several varieties of orchid. The excellent hotel , where English is widely spoken meant a lovely homecoming each evening.Wonderful gourmet menu etc completed our day! Thank you! Good location for walking and other things of interest. Hotel was a bit odd although comfortable. Being larger than some it was not so friendly as some of the smaller hotels, although the staff we individually friendly there were quite a number. Despite a week of rain we were able to enjoy walking and the hotel was really good, though couldn't really appreciate the outside facilities. Only thing that would have helped would have been access to a drying room for waterproofs and boots. This was the best holiday we have taken with Headwater! Despite imperfect weather, the walks were wonderful (even though the vultures did not fly when it was raining); we saw the Rivers Tarn and Jonte both as green and peaceful and in full spate after rain. For those interested in wild flowers, this is a perfect holiday in May - the deciduous woods and meadows are full of them - lilies, orchids, asphodels ... and there are many birds besides the vultures in the trees. Besides walking the main walks we also visited Montpellier le Vieux - do go and take the red route, the rock formations are stunning : Aven Armand - more commercialised but the stalactites are amazing: Vulture Museum (don't go on a wet day, there are no live vultures to see); finally, on our return journey to Toulouse, the Roquefort Society Caves - most interesting! The hotel, food, local wines, beer & picnics were excellent with wonderful service from the staff. THIS PARTICULAR HOLIDAY ,THANKS TO THE HOTEL AND THE WEATHER WAS ONE OF THE BEST HOLIDAYS WE HAVE HAD WITH HEADWATER. THE WALKING IN PARTICULAR WAS SUFFICIENTLY CHALLENGING AND ADAPTABLE . SPECTACULAR VIEWS . THE AREA ITSELF WAS VERY INTERESTING, FROM ALL PERSPECTIVES. GOOD NOTES AND GOOD MAPS. Challenging and varied walking in spectacular surroundings, with the additional bonus of a comfortable and friendly hotel base providing excellent cuisine. A superb location for walking and an excellent hotel - the staff were friendly and always very helpful. Travel arrangements - flights and car hire all went smoothly. Exactly what we had hoped for. We also extended the car hire for a further three weeks and delayed our return flight for the same period. Headwater arranged this for us when we booked and everything went according to plan. Fantastic hotel with amazing food in great location. Very friendly staff who were always smiling! Stunning scenery and brilliant walks. Hotel de la Muse du Tarn is not only our 'best' Headwater hotel but probably one of the best hotels we have stayed in worldwide. We had one very wet day and the hotel was a comfortable and pleasant place to take refuge with books and crosswords. The walks were well described and accurately graded, we felt. Although one or two of the descents were longer than implied but maybe that was because I am very very slow!! The whole region is stunning with lots to do apart from walking. We didn't have great weather but it didn't dampen our walking spirits. And the views - wow! Beautiful part of France, stunning gorge scenery. Hotel in brilliant location right on riverside. Excellent food with choice from whole menu every day + chef's special of the day for each course. Highlight was lots of lovely butterflies! brochure, doe's not do justice to the astonishing location and overal excellence of the hotel which is 4 star and not 3 star as printed.We have looked at this holiday for at least 10 years, and booked this time as we are running out of options in France. The Tarn area is an location for activity holidays and for seeing wildlife and flowers. This hotel is really a 3 star hotel tying to live up to 4 star standards. the food selecting for dinner was quite limited and did not offer the range and quality that was expected. Cost of drinksat both the bar and the wine list prices where far too expensive andf put us off drinking. It would help walkers if the maps were actually marked up with the routes as this would only take minutes and would help to cross refer to the headwater maps. Even better would be down loads for walkers to use their own GPS devices whilst walking. Fabulous walking in amazing landscapes along the gorges, along with a very comfortable hotel with delicious food and excellent service, made this a great holiday! The scenery along the Tarn was sublime - like a cross between the Lake District and the Grand Canyon but with more trees. Would recommend bringing small binoculars to watch the vultures (walks 2,3, and 5), and a small torch for shining in the caves (walk 6). Start early to avoid heat of midday sun. Fantastic variety of beautiful butterflies especially at the start of walk 5 (in late July). Absolutely charming staff at the hotel. Superb location with great walking.Notes provided were fair but only worked because there were not too many paths to choose from so you just stayed on one path for most of the walk (unlike England where far more detail would have been necessary to choose the correct path). I feel the grading of the walks we did was rather misleading as a lot of them involved narrow cliff edges and steep scrambles which I would say were at least 'moderate'. The scenery was magnificent and the hotel was excellent. I liked the bedroom (light, modern and airy with a large comfortable bed) and the food was very good indeed (especially the nights when we could choose from the a la carte menu). The main problems included a lack of a booking for our dog despite having paid extra for this facility. However, Headwater has recompensed us for the money spent so we now are satisfied overall. The walking experience was excellent and the area quite dramatic and well worth the visit. We have sent a letter (via email) to you concerning our dining experience which we hope you will take note of. A very enjoyable walking holiday in some beautiful countryside. Hotel was good but we felt the wine prices were unreasonably high and we went out for pre- and post- dinner drinks. Your explanation of the mealplan was unclear and you did not respond to an email query on this subject. On 4 nights there was no choice at all on the mealplan The walks were outstanding and we did 4 of them (1,3,4,10). Fellow guests (especially Headwater) very compatible. Hotel staff outstanding (except for one apparently new and untrained barman. An excellent trip in a great location. However, having spent a day walking high in the heat we expected to relax by the swimming pool and cool off. We were very disappointed to find on arrival that the hotel did not intend to fill and clean the pool until the day we left (June 15th). An empty swimming pool is not attractive and very frustrating, and to a small degree took the edge of an otherwise great trip. Indeed it had been part of the promise in the Brochure and the hotel website. We would not have booked this week if we had been given this information by yourselves beforehand as we were flexible on dates. I have therefore answered no above as what was promised was not delivered and in future would need reassurance. Otherwise the scenery and floors/birds were stunning and the hotel good. Food excellent, wine expensive and some service erratic, but entertaining. Thoroughly enjoyable, inspiring walks, excellent food and accommodation . We went in May: the weather was poor. We had two good days, two days of rain & sun and two days of steady rain. And it was cold (one day scraped up to a maximum of 8 deg C). The area is great for walking and the Headwater walking guides were excellent. The hotel was comfortable and the staff were helpful and friendly. The common areas of the hotel were well laid out and on one night the log fire was lit. But our first bedroom (room 14) was directly over the kitchen. The kitchen equipment was so noisy at night that we had to move after two nights. The next room (room 32) was disappointing: no shower curtain or screen; no balcony; a small window made the room dark; and no fridge. But it was quiet. The hotel was expensive: 9.50 euros for two cups of tea (two tea bags). There was no house wine and the lowest price for a bottle of wine was 23 Euros - and this is France! The food was disappointing. On four nights we were given a table d'Hote menu with no choice, even for the main course. Considering that this holiday is billed as a gastronomic experience, the Table d'Hote meal was very limited and underwhelming. We had to send a fish course back because it was under cooked and we had a duck course which was very tough. I have eaten at Auberges in France and the Table d'Hote meals have been much better. On three nights we had the A la Carte menu which was a distinct step up, but still nowhere nearly as good as I have had in French restaurants at considerable less cost. To sum up, the Tarn is an excellent area for walking, Headwater's arrangements were first rate, but the hotel and the food were disappointing. Saturdays from 4th May 2019 to 21st Sep 2019, for 7 nights. All dates are subject to availability, please contact us to check. Tour only: The above tour-only prices exclude flights but include a Europcar Group B air-conditioned hire car which you collect from/return to Toulouse Blagnac airport. If no car is required there is a reduction of £100pp on the tour only. Due to the tailor-made nature of our holidays, we need a little more information in order for us to check availability for Dramatic Vistas of the Tarn. Simply complete the form below and a member of our sales team will contact you (when it's most convenient for you) to provide availability information, travel options and an accurate price. Of course there's no obligation, but if you do wish to proceed with a booking they will be on-hand to assist you throughout the process.